Join Kim Murray from Happy Heads for her Calming The Mind workshop, introducing you to simple mindfulness tools. Happy Heads teaches simple mindful tools & techniques that improve the mental, physical and emotional well-being of people of all ages - building confidence, reducing anxiety, improving self esteem and increasing focus to help you deal with stress and big transitions in your life. Most people think they can’t meditate and it's all about sitting still and being silent - I promise you it's not! I make it really simple and accessible for everyone no matter what your age, experience or temperament. What can people expect from the workshop and what might they take away from the experience? I’ll be teaching you how to stop, think and breathe - empowering you with simple mindful tools and techniques that build confidence, reduce stress, increase focus and release self doubt. Meditation helps improve both mental and physical well-being bringing you back into balance when you need it most. This two hour workshop has been specifically designed to help improve both mental and physical wellbeing and includes - insight into the brain, shortcut breathing techniques (mini meditations), guided meditation and Emotional Freedom Technique. EFT is a great way to help release negative thoughts and tension held in your body, enabling you to be the best version of yourself. You’ll leave having a clear understanding of how simple meditation can be and how to utilise EFT, so you’ll be fully equipped to integrate the techniques into your daily routine. Q: Could you tell us about the practice of EFT? EFT works like a non invasive form of acupuncture - instead of using a needle to relieve tension, where your energy lines (meridian lines) begin and end they are closer to the surface of the skin so you can tap them to release the tension and negative blockages that you hold in your mind and body. EFT uses Neuro Linguistic Programming techniques. Neuro refers to your neurology, linguistic refers to language, programming refers to how that neural language functions - it's like learning the language of your own mind. Tapping is a powerful tool for helping your mind get to the core route of a problem, identifying where a limiting belief came from and then processing that memory - releasing you from its emotional charge. Q: What led you starting Happy Heads? Having worked in Marketing & Events for over 11 years I was accustomed to a high pressure job. In early 2016, a hugely stressful work situation left me suffering from anxiety and depression. Two things I'd never experienced before and the sharp decline was both out of character and completely debilitating. Looking for solutions to get me back on track, I began to meditate and took a life changing week long course called the Hoffman Process. It was during this time that I realised the true power of meditation and visualisations, which helped me lose all my anxiety, depression and properly grieve for my dad who sadly took his own life when I was 7 years old. It was a profound experience and I decided that I needed to change career and help people of all ages look after their mental and physical wellbeing, which led me to launch Happy Heads. Q: What does a day in the life of Kim look like? I wake up at 7am most days and the first thing I do before anything else, such as check my phone or email, is meditate and anchor myself in the present moment. I sit in a chair and do my morning check-in to notice how I’m feeling that day. Depending on what's going on for me in that moment the morning meditation will vary - finishing with positive affirmations is a really great way to start your day. My mind is clearer first thing so before it's been bombarded with information I try to do anything that requires a creative output early - blog & social posts, creative writing, meditation workshop planning, designing new visualisations and retreat plans. In the afternoon I often lead meditation workshops in companies. Having come from that world I know exactly how to help people reduce their stress and anxiety, which leads to improved work / life balance. This is such a hard question as I absolutely LOVE both. Watching a sunrise or sunset is amazing for the soul and makes me so happy. If I had to decide I would say a sunset, it's the perfect way to end the day and the spectrum of colours that fill the sky are always incredible. Book here to join Kim on the 18th May. Join Vanessa Joy & Natalie Owen on Saturday 30th March for an afternoon that promises to be both two hours of me-time, as well as an opportunity to explore the concept of selfcare, and different practices that you can add to your own toolkit. Q: What can people expect from the Selfcare Staycation? V&N: We got very excited when we came up with the title ‘Selfcare Staycation’! We were looking for a way to convey that the workshop is both an experience in itself, a standalone event - two glorious hours to take time for yourself, leaving the rest of life outside the door for a little while. But we also intended for the workshop to be an opportunity to learn and explore - to consider selfcare and the role it plays personally, and to provide people with accessible experiences they could take back into everyday life to utilise when needed. Q: How did this workshop come about? V: Nat and I had so many conversations about tapping into subtler practices that brought us into our parasympathetic nervous systems, and how pivotal that was for our wellbeing. Not just when practicing but using them actively during our days to navigate life. We noticed the significant knock-on effects the practices had in other areas of our lives. N: Yes, in particular, I noticed myself getting tidier - if only my mum had realised that the key to my messy teenage bedroom was a regular savasana practice! :) We started to refer to the feeling as a ‘parasympethetic paradise’ which was the first kernel of an idea that led to this workshop. Q: What’s the parasympathetic nervous system? N: Broadly speaking, the nervous system has two sides - the sympathetic and parasympathetic. The sympathetic can be thought of as our doing side, and is also the side that is activated when we get stressed (you’ll likely have heard the term fight, flight or freeze). The parasympathetic is the calming side, the balance, (you may have heard it referred to as rest & digest). Historically human stressors were short lived - maybe the appearance of a predator, or an invading tribe. The stressor would be dealt with - either by fighting, flying (running away) or freezing (playing dead) and then the stress response would pass, the parasympathetic side would then activate in response. Modern stressors however are a little different. We are in less immediate, life-threatening danger, but they are often longer lived. The arrival of social media and the 24 news cycle are often given as examples. As a result, our sympathetic nervous systems can become chronically activated, so part of the aim of the workshop is to give people experience of practices that help to stimulate the parasympathetic side to provide some more balance. If you’ve ever come out of a deep savasana, a yin or nidra and felt grounded, calmer, like everything has slowed down a little, you are in what Vanessa and I would call a ‘Parasympathetic Paradise’. Q: What are your favourite selfcare practices? V: Yoga Nidra is my go-to! When I’m up teaching at 7am and then again in the evening until 9:30pm it’s dropping out for 20 minutes during the day and listening to a Nidra that gets me through. N: Savasana is definitely my fave. In a bizarre turn of events, I spent the day following the Brexit referendum result in a day-long savasana training, and without a doubt, during the weekend that followed I felt calmer and less reactive than I would have been otherwise. My most important practice however is tidying - we’re both big believers that Selfcare isn’t all bubblebaths and massage, it’s also committing to doing the boring stuff that helps maintain our overall wellness. A small island off the maincoast of Japan is home to one of the oldest, healthiest and happiest communities on the planet. The logenvity and wellbeing of the inhabitabts of Okinawa are said in great part to be down to what they refer to as 'Ikigai' - they all have a reason for being. In this unique, 4-workshop course, Sarah Rush will introduce you to the concept, and support and guide you through the process to find your own Ikigai. All workshops will incorporate yoga and meditation practices to compliment the theme being worked with that month, as well as journalling exerscises to help bring bring to light the personal factors that will lead towards you finding your ikigai. In this workshop we will look at how we can sometimes feel “stuck” in our life and start to identify the ways we often limit ourselves and hinder our true potential. We will examine the idea of ikigai and how we can create time and space to allow ourselves to dream big. A practice focusing on releasing the past & courageously embracing the new. Through journaling exercises we will identify our inner criticisms and then look at ways we can challenge the inner narrative, allowing us to consciously create a kinder way of thinking. A practice on building strength and resolve, along with changing our perspective and all that we think we “know”. Building on the dream areas we identified in Workshop 1, we will look at the concepts of vikalpa and sankalpa and start to come up with practical steps to achieve our dream areas. We will be honest about how we often sabotage ourselves, noticing what those patterns may look like for you personally, and develop a set of consequences if we do follow through with the steps we set. In the final workshop we will venture out of East of Eden for a half day retreat nearby to draw all of the themes of the course together and define our Ikigai. We will practice visualising and manifesting through a series of exercises and assignments and create daily rituals and practices that keep us on our new path and help us to consciously create and live the life of our dreams. The closing practices will reinforce all that we have worked on throughout the course, aiming to bring clarity and purpose to our vision. All participants will have the option to join a closed Facebook group for peer and teacher-led support throughout the duration of the course. At the end of each workshop there will also be several optional assignments that can be completed in the time between workshops to give students the option to go deeper in their exploration. Feedback will be given between sessions and you are encouraged to find an accountability partner within the group to support each other on this journey. If you are as excited as us about this workshop series, you can book below with the earlybird price of £140 before the end of 2018! “Following attending Sarah’s Find Your Ikigai course I was able to manifest myself into a nice little apartment in a hilltop village in the heart of Abruzzo, Italy. An ambition I’d had for nearly 20 years. In addition to buying a ‘bolt hole’ in Italy I had also, following the Ikigai workshops on manifesting and writing my dreams, been able to sort out six years of overdue taxes as well as claim £20 000 pounds from an insurance company who was withholding funds due to incomplete paperwork from me. The money now sits in my bank account. Join Sarah on the 27th October as the clocks go back to learn about the lymphatic system, and a series of yoga practices that can help boost immunity as we enter the coughs and colds season. Q: Tell us a little about what to expect from your upcoming workshop on boosting immunity. We will begin with a talk on the lymphatic system, learning how it works and offering practical ways to assist the flow of lymph to boost immunity. We will then move into a yang (dynamic) yoga practice, including pranayama to build heat and clear toxins from the body. The second half of the practice will focus on yin to help lymphatic drainage and stimulate the lymph nodes. Q: What is the lymphatic system? Q: How do the differing yin and yang practices work to help the immune system? The yang practice will boost our circulation and build up heat with plenty of twists that squeeze and compress our internal organs and tissues to help clear out toxins followed by the yin practice which, in this workshop, will focus on the parts of the body where the lymph nodes are. Q: Tell us a little about the parasympathetic nervous system and how the relaxation at the end will help. Our nervous system is in two parts - sympathetic (or “fight or flight”) which is when we’re in a state of stress. In the short term this can be a good thing to help us deal with perceived threats but long term the stress hormone cortisol (released during fight or flight) is not good for our immune health and can cause inflammation in the body. Ideally we want to be in a parasympathetic nervous state (or “rest and digest”) as in this state the body digests food, enters a relaxed state and can heal itself. Through slow conscious abdominal breathing we can move from the sympathetic to parasympathetic state. Yoga fits in wonderfully here with it’s emphasis on the breath and helping us learn how and where we hold pockets of tension in the body. Q: What do you do besides yoga to help your immune system? The foundations for a healthy immune system are good digestive health, movement and sleep - these all have a massive effect on our overall wellbeing and we will be looking at these too during the workshop along with how essential oils can also support healthy immunity. Q: Hey Liz! We're so looking forward to your upcoming workshop on Yoga for the Womb tell us a little bit more about you and what you do? Namaste! I'm really looking forward to being there! I have my own small business, Holistic Health Derbyshire. I teach weekly Vinyasa flow classes and private womb yoga sessions, run workshops and hold women's circles and retreats in the Peak District. I'm also a Mizan Therapist so I see private one to one clients in my home in Cromford to support with their reproductive health. The workshop will bring together my two favourite things - Womb Yoga and Mizan Therapy. We'll explore simple and powerful techniques to reconnect joyfully with our naturally arising feminine wisdom. We'll tune into the power of our cyclical wisdom through the art of self-care massage, Yoga asana, pranayama breathing, meditation, chanting and menstrual charting. Q: The workshop sounds so interesting! What can women hope to gain from the experience? The aim of the workshop is to provide the tools to restore health and vitality through the power of tuning in to inner wisdom – the inner goddess! Women will learn the art of Mizan self-massage, connecting with their womb space through meditation and pranayama breathing, and a series of easy-to-remember Yoga asanas. Attendees will also be given a template for menstrual charting to take home and use in the coming months. Depending on individual needs, women may also like to take away Yoni steams, castor oil packs, fajas (womb binding), and herbal teas to balance hormones. Q: What led to you specialising in these areas? I started practicing yoga in 2007 whilst I was living in South Korea. Then, as with most passions, it was my own 'journey' that led me to become a womb whisperer. A series of health issues led me to two wonderful women - Bushra Finch (Mizan Therapy) and Uma Dinsmore-Tuli (WombYoga). The universe can be a little bit cruel sometimes when it's steering you on the correct path, but I am undoubtedly on it now. Feeling happier and healthier than ever, and totally in tune with my inner wisdom, I feel compelled to spread the womb love . Q: What do you do when you're not on the yoga mat? I'm currently training to be a Naturopathic Nutritionist which is taking up loads of my free time, but it's totally fascinating! The human body... just wow! Over the summer I've been spending as much time as possible in the garden... It's a new project. Slugs 1, Liz nil. Q: What does a day in the life of liz look like? Pretty much every day begins with some form of yoga and meditation (so as to avoid grumpiness) , has a yoga class at some point, and ends with a massage of my womb. The bits in between totally depend on where I am in my cycle. Sometimes I spend QT with my favourite people - sometimes my time is non-negotiably mine.... I've learned to plan social occasions within the limits of my cyclical capabilities! Q: What is liz doing in an alternative universe? I very much hope the same thing! Both! By the sea preferably. Bridget joins us on Tuesday mornings, 9:20am, with a class aimed to nourish, a sanctuary to land within. I read a book about yoga when I was a teenager, I had glandular fever at the time and had to miss a lot of school so I was raiding my mother's bookshelf for reading material. I experimented with the poses - they were super simple - and they made me feel better. I had this strange feeling that one day I would teach it, which seemed absurd, it wasn't a real job (except in Dharma and Greg) and I couldn't even touch my toes. But something about it felt deeply right, I felt a sense of 'coming home'. I had an on-off love affair with yoga for ten years. In my late twenties I was at a turning point in my life and my local yoga studio became a sanctuary, where that feeling of 'rightness' came back to me and I just knew I had to become a yoga teacher. And so I did two yoga teacher trainings simultaneously (which I do not recommend - it was very intense!) and dove into teaching full throttle. Now about decade later I am still teaching, growing and learning... but at a more leisurely pace, with more time to relax and do other things in between. Q:What can people expect from your Tuesday morning class? I hope that the class can be a sanctuary and space to nourish. So that people who come can find that sense of coming home, of landing into their bodies, which I now understand is what 'embodiment' is. I generally theme my classes, either with an anatomical focus or perhaps a concept that has inspired my practice. I tend to teach slow strengthening flowing sequences that grow in complexity during the class and I pepper in rest, meditation and breath-work. I offer subtle alignment details but try to keep the movement of the class focused and meditative. I’ve studied and practiced different styles of yoga, as well as some Pilates, dance and movement. Currently I am training in the Embodied Flow school with Tara Judelle and Scott Lyons which has really resonated with me, so some of my themes are inspired by their principles. I think yoga should be open to everyone and we can all just meet where we are at, no matter whether we can touch or toes or stand on our hands. I’m interested in how we move and transition, rather than achieving a final result, to keep curious and open to new discoveries in our bodies and minds. Q: What's your favourite thing about teaching yoga? I love the moment in a class when people tune in - to each other, their breath, their bodies. Something indescribable happens and everyone seems to sync up, moving and breathing with awareness in themselves and the space around them... the tension drops down a notch and it feels totally magic. Q: And what are some of the challenges that the job brings? Oh goodness, that’s a really big question. Like everything, it has its challenges! It can be hard to stand up in front of a room full of people and share something that feels so intimately personal, something that you love. And then sometimes people don't like what you are offering and I find that can be challenging. But if I remember why I do what I do and tune into my highest intention as best I can, then worrying about what people think of me doesn't matter as much. Q: Where's the strangest place you've done yoga? I once went to a yoga class that was in a night club the morning after, the floor still stank like booze, it wasn't the most relaxing experience! Q: What does a day in the life of Bridget look like? Every day is different! But I guess ideally I’m starting the day doing meditation, yoga and some journaling - these are the things that keep me sane. Somewhere in there is coffee and breakfast. Then during the day I’m either teaching yoga, doing some admin, writing or dabbling in some other creative projects . And then of course resting, practicing, and being in nature whenever I can to recharge myself. Q: What is Bridget in an alternative universe doing? I love both. But probably sunrise, watching the sun light up the dark skies, with a chorus of birds and the moon lingering, is heavenly. Join Bridget on Tuesday mornings, 9:20am in Studio 2, and see here for her upcoming courses and retreats. Tuesday nights are now home to Embodied Vinyasa, a new class at 7pm with teacher Nathalie Joel-Smith. Curious about what an embodied class is? We asked Nathalie for a little more info on this practice, and what led her towards it. Q: What is Embodied Vinyasa Yoga? A: Embodied Vinyasa is less about the shapes we make with asana (poses), and more about the experience we have within and moving between these shapes. It is a flowing practice that invites you into a deeper awareness of being in your body, it is a way of sensing, moving and arriving throughout a Yoga class, to cultivate presence and improve your relationship with yourself, your body and your life. - experiencing your anatomy - Information about your bones, muscles and connective tissue is offered as guidance for how you move through the practice, so you can feel it! Explore how your body is designed to move, how you can find more efficiency and what feels good for your individual body. - curiosity and exploration - Becoming aware of bodily sensations and letting go of how things 'should' look, this flowing practice is an exploration of how things feel. Through a variety of movement possibilities, we get curious and find new pathways. This becomes a metaphor for how we live our lives, which is part of what it means to be embodied. - ground and space - The relationship between gravity, the ground, your body and how you move through space is explored. This helps improve mobility, strength and function. It allows you to become more in tune with yourself and your surroundings, and creates the conditions for shifts in mood and energy. Q: What can people expect from your Tuesday night class? Q: What feedback have you had from people in the first few classes? I’ve had some great feedback from students so far. One lady said that life feels full of jerky movements, and it felt so good in her body to do something smooth. Others have commented on the link with mindfulness, and how relieving for the mind it is to really tune into the body, and move in ways that feel spacious, supported and self-aware. Q: Tell us a little about your journey into teaching yoga and embodied vinyasa. A: I started Yoga 20 years ago, as a teenager with a back injury. It became obvious early on that Yoga alleviated anxiety, which was revelatory for me. My original and still beloved Yoga teacher (Julie Martin) transitioned from ashtanga to vinyasa flow, and I followed her journey, eventually training with her in India. On returning to London I found a mentor in Mollie McClelland Morris, who works with the Franklin Method which encompasses embodied function, and my practice evolved from this. I then studied Space and Flow with Raphan Kebe, which had a significant impact on how I moved and taught Yoga. I have been to many workshops along the way with different teachers, wherever something captures my interest, all of which has placed its own special inspiration in the pot! All of this has landed with me in beautiful ways that feel wonderful in my body and have created huge shifts mentally and emotionally, allowing my relationship with myself and my life to evolve. This is a ongoing process, and I would say embodiment is now at the heart of how I live my life. Q: What do you enjoy doing when you're not on the yoga mat? A: I trained as an actress, dancer and singer, and am still engaged with this, whether it be performing myself, or working with artists in the realms of embodiment. I write poetry and songs (and the occasional rap!). I also very much enjoy red wine, chips and chocolate, usually in that order. The love of my life is a Bullmastiff called Hugo - a 60kg dog who behaves like a teddy bear. This April, East of Eden turns three and we're rather excited about it! Starting from just one small studio with 28 classes and 8 teachers three years ago, we now have two busy studios with over 90 classes and 43 teachers, and lots of exciting things ahead for 2018. Please join us for an evening of Kirtan on Friday 6th April at 8:15pm. Kirtan, the practice of chanting, comes from the tradition of Bhakti Yoga - Bhakti being the path of love and devotion and yoga of course being union. In Kirtan we use the voice, singing together to unite our heart, mind, body and soul. Come along to help us celebrate the last three years. As well as celebrating with Kirtan, we have a few birthday offers running throughout April. Zara, tell us a little about Ummah Yoga - what is it and what led you to start the class? Ummah Yoga is a women’s only class on Thursday afternoons at East of Eden (a yoga and pilates studio in Walthamstow). I created Ummah Yoga because I live in Waltham Forest where nearly a quarter of the population is Muslim, however I noticed that Muslim women were notably absent from the yoga studios I was attending. I thought this may be because a lot of classes tend to be unisex so I felt that there was a need for a women’s only class that sensitively accommodates women of the Islamic faith. I approached East of Eden who had been thinking of adding a women’s class after having requests from women in the muslim community, so Ummah yoga was born. What can people expect from an Ummah Yoga class? Ummah is the Arabic word for community (Arabic: أمة‎). In this case the Ummah is a collective of women practicing yoga together. My classes fuse Islam and Yoga. For example, I interchangeably greet people with “namaste” which means that "the divine in me bows to the divine in you," and "as-salaam-alaikum," the Arabic greeting meaning "peace be unto you." This is a safe space where women are free to take off their headscarves (should they wish to do so) and to practice the exercise of yoga together without any judgment. With all this in mind, anyone should be able to come to my class and feel welcomed regardless of faith and religion. I try to use a dialogue that promotes inclusivity and the commonlities in the many different views, faiths and practices people have. My classes are slow, steady and meditative. We practice sabr (صَبْرٌ), the Arabic word for patience; by holding each pose for longer we exercise the virtue of patience and endurance. This gives your body the chance to relax and open into the stretch, as well as giving me time to provide students with individual attention. I offer options for beginners and more advanced students so anyone can drop into the class and have a go. What might be some of the benefits people will experience from attending ummah yoga? Yoga is beneficial to your wellbeing both physically and mentally. The physical strengthening, balancing, stretching and cardio side of things will be beneficial to your body in terms of muscle toning, improved circulation, bigger lung capacity, better bone health, stronger joints and a better quality of sleep. But in addition to this, learning how to channel your energy using breathing and meditation techniques can be useful in de-stressing yourself and reducing anxiety. This will lift your mood and in turn it will improve other cognitive functions such as self-regulation of emotions, focus and memory. It’s also a great opportunity to get out the house and socialise with likeminded people. Tell us a little about your yoga journey, what brought you to the practise and what keeps you coming back? I stumbled across yoga in my office gym when I used to work in the city and from then on I was hooked. I fell in love with the sense of calmness I felt after attending each session. I had a busy job and with that I developed a busy mind so when I’d take my shoes off and come to sit on my mat I was giving myself some much needed me-time. To sit down and observe my thought patterns, to quiet the noise in my mind and to listen to my body is something that I had previously neglected. That’s the beauty of yoga; it unites the mind with the body through meditation and exercise. Something that the treadmill can’t do! I didn’t realise how much tension I was holding in my shoulders, how weak my stomach had become from sitting at a desk all day and in turn how I was developing a hunched figure from poor posture. When I started to feel and see the difference in my body I wanted to keep going so I could keep myself in that fit and healthy state. Despite this, yoga is a never ending journey. At first it’s the feel-good factor that I went for, then I started having these mini accomplishments like finally being able to touch the ground with my fingertips, and after a consistent and dedicated practise I started to enjoy getting into some of the crazy up-side-down pretzel poses that I never thought I’d be able to do - practice and all is coming! What do you enjoy about teaching at East of Eden? I really love the community vibe about East of Eden. There are people from all walks of life that come along to the studio and there’s something really authentic about them. The staff are all friendly and I’ve made some really good friends with the other students that I used to go to classes with. The studio in itself is a clean, open space and it’s a peaceful environment to practice in without any distractions. Why not come along and check it out for yourself? Join Zara every Thursday at 1:45pm for Ummah Yoga. Ever heard teachers talk in class about the chakras and wondered what they were all about? Join Vanessa Joy for this experiential workshop to learn more. Chakras are key energetic points within the body. There are believed to be over 100 within the human body as a whole but there are 7 main chakras poised over the spinal column that are most commonly referred to in classes. Each chakra has a series of qualities related to it which reflect our experience within life. For example, the root chakra is our foundation, and so relates to our feelings of stability and groundeness. A person for whom this chakra is out of balance may experience an inability to ground, maintain routine etc, or conversely, may feel too sedantry and find it difficult energising. How do the chakras relate to a yoga practice? Moving through a traditional Vinyasa Flow sequence, we already honour the practice of working from the Root Chakra (Standing Poses, Grounding and Foundations) all the way to the Crown (Inversions). Whether we acknowledge it or not, the chakras are benefiting from the alignment, breath awareness and physical practice of asana that inherently seeks wholeness. Powerful shifts can happen when we bring them to light and start working with them consciously. How has practising within the chakra framework helped you in your own life? After practicing asana for some time I was intrigued how there were shifts occurring within me that were more than just greater flexibility and strength. Learning about our energetic body and the chakra system gave me a framework to reflect and understand how I was relating to myself, my relationships and my environment. Practice became less about the physical and more about aligning myself, with myself. It was then my yoga journey started to move off the mat. What can people expect from the workshop on the 3rd March? I wanted to create something to deepen people's understanding of the chakras that was accessible and help people relate what is happening on the yoga mat to the bigger picture of their own life experiences . We will open with some Yin poses, a chance to settle and learn about the energy body and then begin to build our Vinyasa practice working methodically through all 7 chakras, from root to crown. We will reflect on the physicality of asana, use breath to bring awareness to these areas energetically and summon experiences we’ve had in our own lives to develop a relationship with each of these energetic centres mentally. Finishing in an extended Savasana we’ll move through a guided meditation with our renewed understanding of the chakras. Is there a particular chakra you enjoy working with or teaching? Muladhara (Root) is a chakra I could always work with and teach on. We all need a little more grounding, security and stability amongst busy city life. Tell us a little about your yoga journey - what brought you to the practise and what keeps you coming back? I originally started practicing to get in the good books of a boss that didn’t like me, and was an avid Ashtangi! Like most of what I did then, it was for someone else. Although I didn’t ‘enjoy’ the practice at first, there was no denying I was a completely different person afterwards and had NEVER felt so centred, calm and me, so I had to keep following its breadcrumbs and fell down the rabbit hole. Its a journey that has connected me back to my body, understand my emotional landscape and presents a philosophy I can absolutely resonate with. I am helpless now to share it with anyone that stumbles across my path. 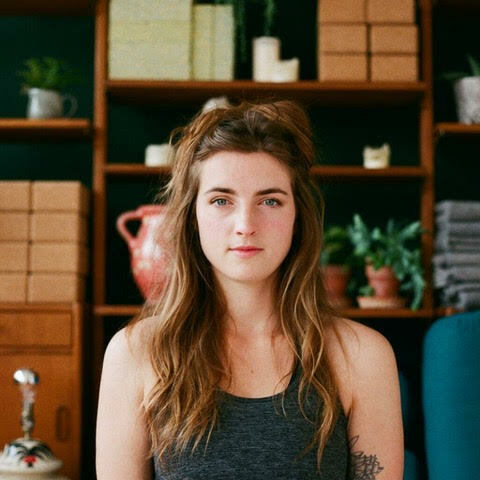 This week, we caught up with the lovely Hannah Verghese ahead of her workshop this weekend, Yin for WInter. Q: What is yin yoga? A: Yin yoga is a slow-paced practice where asanas or postures are held for anywhere from 3-10 minutes to target the thicker layers of connective tissues around the joints, and the fascia that covers the body. Yin yoga can release physical tension, calm the mind and regulate energy in the body. Q: Tell us about the 'Yin for WInter' workshop, what can people expect? A: It is a 2 hour slow and calming practice intended to encourage a sense of harmony in the body and quiet of the mind. We’ll begin together with a group meditation then move into approx 90 minutes of yin asanas, before closing with a long and nourishing savasana. The nourishing yin sequence has been chosen to compliment the winter theme, intended to support the immune system and vitality in the body, which is often challenged in the winter months. Q: What are the advantages of a yin practice during the winter period? A: Yin is the dark, cool, quiet inward energy. Winter is the most yin-like of all the seasons and January in particular is a time for rest and self-reflection after the hectic holidays. Practicing yin yoga in winter invites us to tap into this energy in harmony with nature. Q: What brought you to yin yoga? A: Injury and exhaustion! A dynamic vinyasa flow and ashtanga practice alongside my martial arts training and busy schedule meant that I was pushing my body to do a lot. For me slowing down was the hardest part of the practice so I overlooked the more gentle styles of yoga for many years. A knee injury forced me to take some time out and I went to my first yin yoga class. I could only describe it as a feeling of coming home to my body; of acceptance. I hadn’t realised until then it was what had been missing for me in my practice. From that point everything changed and my practice became much more balanced and intuitive. Inevitably the many benefits of this continue to weave their way through my everyday life. Q: What's your favourite yin pose? Q: What can people take away from the workshop? A: What each person takes from this will be as entirely unique as they are. One of the most enjoyable things as a teacher is hearing about the many reasons people come to the practice and the benefits they take away, whether they be physical, emotional, mental or even spiritual. I believe there is something for everyone in this practice, it all depends on your intention. Overall I hope that people will leave the workshop with a sense of calm, grace and peace that comes from slowing down. Q: Do I need to have practiced Yin Yoga before? A: Attending a yin workshop offers an opportunity to delve deeper into the practice and more time and space to explore how it can serve you. There will be plenty of options and variations given which means it is suitable for all levels including beginners. In the final workshop we will draw all of the themes of the course together and define our Ikigai. If you are as excited as us about this workshop series, you can book below with the earlybird price of £120 before the end of 2017! If you'd like to register your interest to be kept up to date about the series, as well as receiving additional content around the Ikigai theme, please add your email below. If you are interested in the Find Your Ikigai workshops and would like to be kept informed of plans for the series and additional events around the Ikigai theme, please enter your email address below. We respect your privacy. Your email address will only be used to send you information on this workshop series and associated Ikigai events. You've probably seen the t-shirts and Instagram posts 'I'm just here for Savasana' and it's fair to say, at busy and stressful times we're often keen to get to those magical 5 mins at the end of class, which often ends too soon. Join Natalie for a chance to delve deeper into the magic and discover just what it is about this part of class that leaves us so refreshed. Come along to practice savasana in 3 different positions, experiencing the different effects on body and mind, before taking a long, luxurious rest in your favourite pose. Savasana, also known as corpse pose, is usually practiced at the end of class, where for anywhere from 5-15 minutes, you lie completely still, usually on your back, and with the only focus or intention being to remain awake. When practised following an asana class, it is a chance for the effects of the practice to be absorbed more deeply by the body. Depending on duration, Savasana is an opportunity for the body's nervous system to move from the sympathetic (the 'doing' side) to the parasympathetic (the rest & restore side). This can have profound effects on body and mind. The workshop will aim to give you both a deeply restful and relaxing Saturday afternoon as well as setting you up with the tools to continue a savasana practice at home, should you so wish. We'll begin with some gentle movement to release aches and stiffness to prepare the body for pro-longed stillness. We'll then undertake some breathing techniques to focus the mind, before moving into shorter practices of 3 variations of savasana. Practicing the pose with the body in different positions can have profound effects on the experience for the individual so the workshop aims to give you a snapshot of each. We'll then take an extended savasana in your favourite variation. What is a regular savasana practice? As with most daily or regular practices, this can fit to the individual. Whilst the ideal would be spending 20 minutes a day in the pose, if that sounds impossible to fit into a busy life, start small. 5 minutes each day, or 10 minutes 2 or 3 times a week is a great place to start. It's also beneficial to experiment with practising at different times of the day. Taking savasana in the morning can be a great way of reducing stressful reactions to events during the day, where as taking savasana when you get home from work can be a great way of 'resetting ' before starting your evening. Stress Reduction - Practising savasana reduces stress both in the immediate moment, and in the longer term if the practise is regular. This in turn has a great positive knock on effect for the body in the reduction of stress-related or aggravated conditions. Clarity of Mind - Reducing stress and body moving the body out of fight or flight can give a greater sense of 'headspace'. Improved Concentration - A calmer body and clearer mind helps still our monkey-minds and find greater focus on single tasks. Better Sleep - A regular practice can lead to better quality of sleep and falling asleep more quickly. Body Connection - Time spent in savasana cultivates a greater awareness of, and connection with your body, and where and when you feel stress. Do I need to have done lots of yoga to attend? NOT AT ALL!! This class is open to anyone, even if you’ve never stepped on a yoga mat before. "I found yoga as a hectic central London restaurant manager. Days were intense, hours long, and relaxation usually involved a drink at the end of a shift or days off spent in bed. Yoga gave me calm and space and then in years that followed, the philosophy of a yogic approach to living really helped to deal with some challenging times. Attracted initially to a dynamic yoga practice, its been in the moments of slowing down where I’ve found the greatest transformations. Without a doubt, the most-life changing regular practice I’ve engaged in has been a savasana practice, allowing my body to switch from an always-on, fight-or-flight state to one of deeper/more pronounced calm, where I notice myself reacting far less to the minor irritations and stressors, and being able to tackle bigger challenges with a greater sense of clarity. I believe that a regular savasana practice could be hugely beneficial to Londoners living busy lives, so I'm very excited to be teaching this workshop in London for the first time at East of Eden, my Yoga home." Click here to book via the main East of Eden site. East of Eden Ltd. info@edeneast.co.uk. 02035837530.